House Housing is an exhibition installed by the Temple Hoyne Buell Center for the Study of American Architecture as part of the Wohnungsfrage exhibition at the Haus der Kulturen der Welt (HKW) in Berlin. 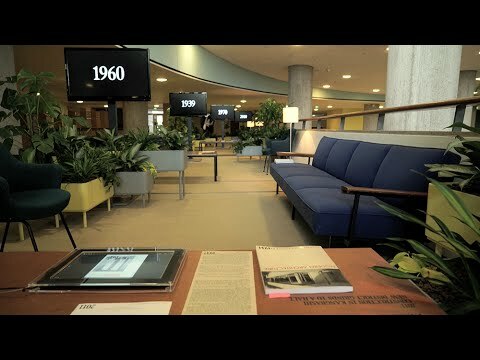 The exhibition is organized around the HKW’s original furniture, which is reassembled into a continuous public lounge that recalls the building’s initial function as a congress hall during the Cold War. House Housing offers a multimedia sample of architecture’s socioeconomic infrastructures, and in the process, shows some of modernity’s basic facts under construction—by governments, industries, institutions, and cultures—beginning in the early twentieth century. It exposes the aesthetic and cultural roots of economic processes related to the development and circulation of wealth, while also offering a glimpse of the history and consequences of government housing policies. The exhibition’s twenty-nine brief episodes, running from 1910 to 2015, locate housing at the center of the current, neoliberal economic regime, with the United States as an influential node in a transnational network that includes Germany’s (and Europe’s) past and present. This network designs and produces the inequalities that are lived everywhere today. With architecture, economics begins from the ground up. The laws of real estate—relating to the acquisition of land, the financing of construction, the cost of building maintenance and services, profit from rent or resale, the value of equity, or the price of credit—inexorably constrain any building component (like a window) or any building type (like a house). They are visible even in the residential work of such singular figures as Frank Lloyd Wright, not least because the Greek oikos, or household, forms the root of the word “economy” itself. But look closely and you will see that what seems fundamental, basic, or natural is, like any other law, a historical artifact subject to change. House Housing narrates its episodes in a mixture of media, choreographed into an audio-visual chorus that spans the HKW’s couches: a whispering, humming history machine. Though they mainly focus on the continental United States, the discrete episodes are excerpts from transnational processes. As such, they address matters of universal concern, even in non-market situations. Their objects range from houses designed by figures as well known as Wright, to a seemingly ordinary gated community in Florida, to the industrialized housing program in East Germany. Their untimeliness is twofold. First, these episodes return us to financial matters widely discussed in the immediate aftermath of the 2008 mortgage foreclosure crisis but now largely abandoned, by mainstream discourse, in favor of greener pastures. Second, the historical episodes, which are assembled non-chronologically, disclose surprising repetitions—of themes, tendencies, and actions. This reminds us that the economic infrastructures on which architecture rests are the outcome of such repetitions, rather than an a priori, natural ground. House Housing was first presented by the Temple Hoyne Buell Center for the Study of American Architecture in the third-floor apartment of Columbia University’s Casa Muraro in June 2014, to coincide with the opening of the 14th International Architecture Exhibition in Venice. Opening shortly before the exhibition in Berlin, House Housing will also appear as a part of the first Chicago Architecture Biennial together with the National Public Housing Museum (with a response exhibition entitled We, Next Door), and then again in the spring at the MAK Center for Art and Architecture’s Schindler House location in West Hollywood, CA.